An ideal bug out bag is stocked with trade sized equipment that is easy to carry and store. When it comes to first aid supplies, the more you can store, the better. That's why, we're bringing you this article that shows you how you can make travel sized single-use Neosporin containers. You can store more of them in several bags and even give some to your friends and loved ones during a crisis. What's even better is that these containers can be tossed away after use so they don't continue to take up space. Making these containers is incredibly simple and won't take very much time! Find out how you an make single-use Neosporin containers for your bug out bag on the next page! whats wrong with the tube its already in? Stupid hack. Rather use original tube to be easy for anyone to identify. Don’t let the cops see it they will arrest you for possession with intent . I use comfrey salve instead of store bought chemicals. Looks like busy work to me. They already come in convenient small tubes with resealable tops. Don’t really see the point in doing this. Not to mention taking up extra space. I get the feeling that these type things are dreamed up by drug store cowboys, that don’t have much time in the saddle. 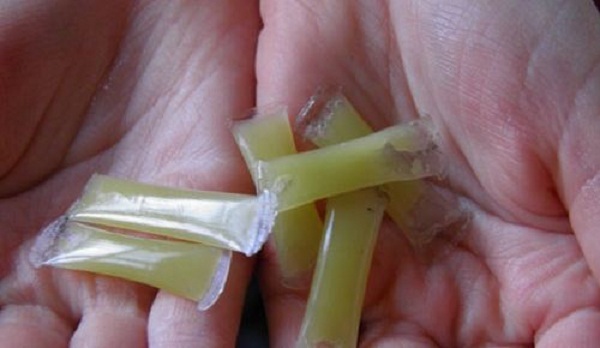 The straw trick has so many more uses than just neosporin. You can make ones with salt or other seasonings for a small kit or backpacking, put Vaseline and cotton balls in one for tinder. I put tinderquicks in the smoothie straws you buy at Walmart, I carry a few Imodium in a straw in my survival kit. I make mini packets of CLP and Grease for my cleaning kit on my chest rig. When I had a mosin nagant I had ones filled with windex to swab down the barrel due to corrosive ammo. You can spot the people that haven’t had to ruck long distances, carry heavy packs or lived out of their pack for a long time. Any quarter ounce of weight I can save I will. You will see these on the AT for a reason. They are light and they work. They’re handy for small things when space and weight are a premium. I keep a couple with vaseline soaked cotton balls in my hill people gear bag. It’s a small bag ghat has a fire kit, my glock, a lifestraw. Likewise single serve doses of aspirin, etc are nice to have instead of a 2000 pill bottle from Sam’s Club. Much easier to fill straw half way then pinch areas off and seal. You could do this with home made salve also no air may keep longer i may expermint.